We are delighted to invite all scientists interested in experimental plant biology to attend the 4th Conference which will be held in Kraków, Poland, on September 21–25, 2009. The Conference is organized by the Polish Society of Experimental Plant Biology in collaboration with the Faculty of Biochemistry, Biophysics and Biotechnology of Jagiellonian University. We are also pleased to inform you that on consideration of our proposal and request for badging, the Meetings Board of the Biochemical Society has agreed the 4th Conference of the Polish Society of Experimental Plant Biology as a Biochemical Society supported Independent Meeting. 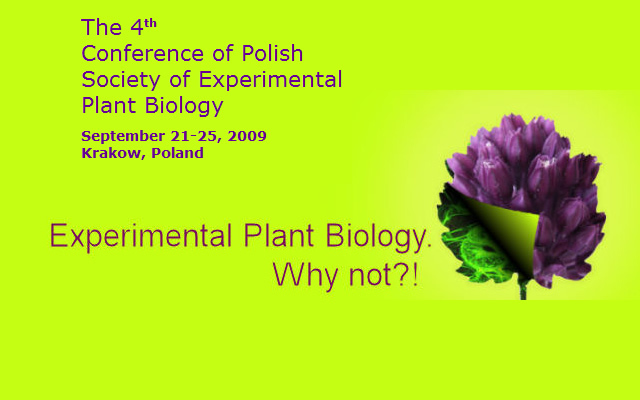 Established in 2001, Polish Society of Experimental Plant Biology, is aimed to integrate scientists working in experimental plant biology, create a representation of the Society and to popularize biological knowledge. The Society acts as a platform for discussion and cooperation of all biologists using plants as the objects of their experiments, pure and applied. The 4th Conference of Polish Society of Experimental Plant Biology will be an event that covers the experimental plant biology topics in an exciting social environment, that extends our knowledge, improves on our practice, and widens our friendship networks. We do hope that you will make it a priority to attend!